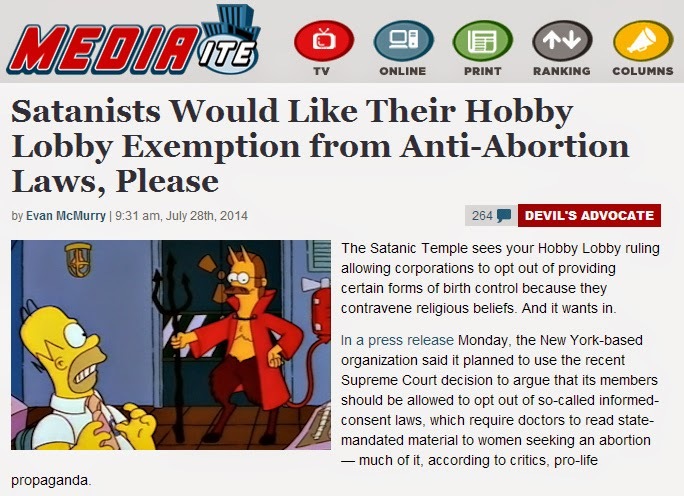 As I understand it, the Satanic Temple is doing some legal jiu jitsu here; they are identifying a current policy they dislike (states with mandatory informed consent laws that prevent a woman from obtaining an abortion without jumping through state-mandated hoops intended to dissuade them from the procedure) and using the Burwell v. Hobby Lobby decision to claim their religious liberties are violated by informed consent laws. I believe informed consent laws are made in bad faith and violate the doctor-patient relationship. I do not believe this is the most effective way to repeal those laws, however I do see value - politically and rhetorically - to both highlight the wrongful SCOTUS decision in Hobby Lobby as well as challenge the legitimacy of informed consent laws. So kudos to another church that I won't join because they'd have me as a member.